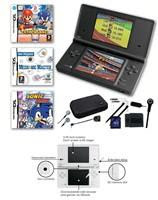 Available now on 24Studio.co.uk, the new Nintendo DSi with game bundles. Bundles include games such as Brain training and Professor Layton, carry cases, storage cards and more. Prices start from just £199.99. Buy now and pay later. Discover the joys of built-in applications like Nintendo DSi Camera and Nintendo DSi Sound which allow you to play with your favourite photographs and have your personal podcasts and songs at the ready wherever you go. Personalise your Nintendo DSi system even further by exploring the Nintendo DSi Shop where you can use Nintendo Points to purchase Nintendo DSiWare: an eve r-growing selection of games and applications that make the most of the many features your Nintendo DSi has in store. Nintendo DSi Camera See the world through your Nintendo DSi with the system’s two built-in cameras. As well as taking snaps and saving them to the internal memory or an external SD Card, the Nintendo DSi enables you to manipulate the images you capture with 11 different photo lenses. Keep your own photo diary and share your favourite snapshots wirelessly with your friends! With two cameras on board and easy-to-use tools to tailor the results to your liking, taking pictures that will surprise your friends is a snap with Nintendo DSi Camera. Play with your pictures, keep a photo diary, watch a slideshow and share your favourite snaps with your friends - wirelessly or via an SD Card. Nintendo DSi Camera features eleven different lenses and endless possibilities. 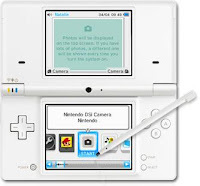 Connect your Nintendo DSi to the Internet and personalise your handheld even more by entering the Nintendo DSi Shop. This is your one-stop shop for Nintendo DSiWare: an ever-expanding catalogue of games and applications that you can purchase with Nintendo DSi Points and download directly to the system's internal memory.